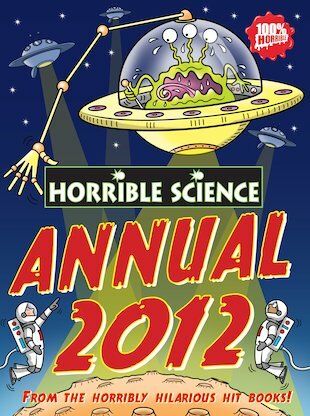 From nuke to puke, take a sick look at science in the world’s only annual with the squishy bits left in! Yes – it’s back, more gruesome than ever, now with eyeball-eating antics and a gross-out puzzle fest! Dear Reader – welcome to your Horrible Science Annual 2012. And what a mind-mashing, stomach-curdling bundle of dreadful shocks it is! Prepare to try out appalling experiments, bend your brains with freaky illusions, gulp at really disgusting diets, and discover sounds that will leave you rushing to the loo! WARNING: this book contains many things that WILL disgust and amaze you, plus oodles and oodles of utterly foul FUN!